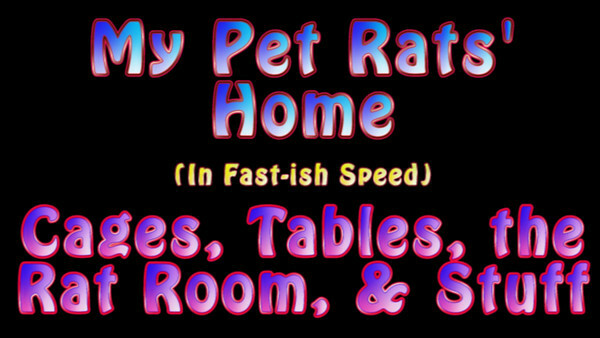 Photos and videos of my Rat Room, an artificial room in the corner of a room. My cages and rat room. The room is 12 ft x 8 ft, walled on two sides with 8 ft x 4 ft cardboard slats; rat-proofed except that they can gnaw through the cardboard if not stared at constantly; wires protected, outlet protected. They get 100% supervision during play time which is an hour or more per day. They have spent most of the last two years of their lives learning to climb and jump and get comfortable with boxes, bins, wire grids, ladders, etc. I helped them transition from small things to big things. Please don't just set something up like this without careful training and building up muscles and skills. Then, they can love such a place. When they were younger they constantly tried to mess with the wires and things I didn't want them to touch, and little by little with some gentle grooming and relocating to "okay" things, they have lost interest in the wires. But I still don't trust them, they are rats and rats live to make messes, and they're just waiting for me to not pay attention.